Swanton Mayor Ann Roth recounts officer Lee Kusz’s effort in helping to save the life of Robert DeVries, while Carol DeVries also looks on. 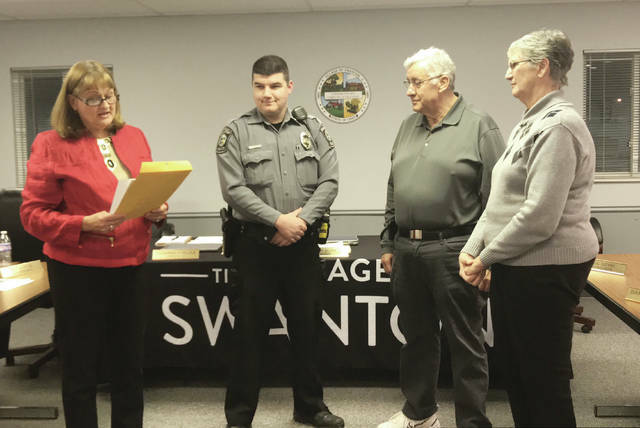 Swanton police officer Lee Kusz was honored at last week’s council meeting for his life-saving efforts. On Sept. 2, 2018, Robert and Carol DeVries were traveling from Archbold to Maumee. Carol noticed that Robert was not breathing and they stopped in the Village of Swanton. Swanton EMS personnel arrived shortly after and were able to help DeVries regain a pulse. He was then transported to the hospital. “Officer Kusz’s quick response and effective CPR contributed in saving the life of Mr. Robert DeVries, and minimized the threat of damage to Mr. DeVries’ body. Failure to act, or delay, could have led to a tragic outcome,” said Roth. Kusz was presented with a certificate of recognition at the meeting last Monday for his efforts. He was also presented with a lifesaver pin by Robert DeVries, who was at the meeting with his wife, Carol. “Without what you did, not only you saved my life, but my family as well. Because it would have changed their whole world,” Mr. DeVries said at the council meeting. Also at the meeting, council took the first step toward putting fire and park levies back on the ballot for May. An emergency resolution for each was to be voted on Monday at a special council meeting. A special meeting was called in order to move forward with the levies prior to the deadline.